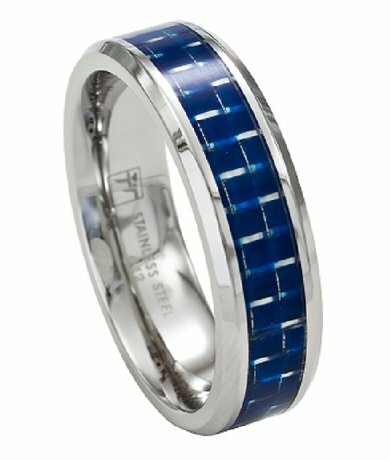 Thoroughly contemporary and edgy, this 7mm mens stainless steel wedding band features a blue carbon fiber inlay. 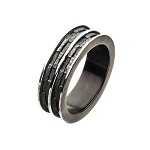 Polished steel edges underline the modernity of this ring, which can be worn as fashion ring or alternative wedding ring. I bought two of these one for my husband and one for my-self so we would have matching wedding rights they look great and my husbadn loves the blue color so that was the major plus in buying and the price and how well they are made all round they are worth the purchase. and fast delivery too that was great to. Thank You. This is the third ring I have purchased from JMR. This ring looks great! It looks even better than the photos. I really like the blue inlay. I have received compliments on this ring. It is durable and takes daily wear with no problems. I say this because I owned this ring for over 2 years. I misplaced it when I moved so I bought another. If you a ring or watch can handle a year or two with me, it HAS to be durable. 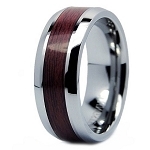 I would recommend this ring as an extra wedding band different from just a metal band.